Notre Dame Fighting Irish forward Elijah Burns (12) is fouled by Florida State Seminoles guard M.J. Walker (23) in the second half. SOUTH BEND, Ind. (AP) — Mike Brey doesn’t know where his Notre Dame basketball team will end up this season following Saturday’s 84-69 triumph over Florida State, but he knows who is driving the car to get them there. “We take our lead from Matt Farrell — he’s been the warrior for us,” Brey said after Farrell, who had missed five games during the ACC season while recovering from an ankle sprain, finished with career-highs of 28 points and six 3-pointers to lead a three-guard attack that also got 19 points each from Rex Pflueger and T.J. Gibbs. Notre Dame (15-10, 5-7 ACC) won for the second straight time after suffering seven straight league losses following injuries to Farrell, leading scorer Bonzie Colson and top reserve D.J. Harvey. Farrell had 19 points in Notre Dame’s 96-85 victory over Boston College Tuesday. “His teammates, when they see that in his eyes, they believe more,” Brey added. Leonard Hamilton, whose Seminoles (17-8, 6-7) have now lost two straight trying to get their coach his 500th career victory, is a Farrell believer as well. Farrell, who was 6 of 10 from 3-point range as Notre Dame hit 10 of 26, finished 10 of 15 from the floor, also had five assists and four rebounds. Particularly Pflueger, whose 19 points also were a career high. He also added six rebounds and four assists. “It’s hard to stop us because we all bring the 3-point threat and the drive-and-finish,” he said. Gibbs, who had just seven points at halftime due to 1-for-6 shooting, made all seven free throws and finished 5 of 16 from the field. Notre Dame shot 27 of 55 (49 percent). “When Rex does what he did today and Matt gets going, the sky’s the limit” Gibbs said. Senior center Martinas Geben added 10 points and eight rebounds for the Irish, who held their own against the taller Seminoles as the two squads each grabbed 35 boards. C.J. Walker had 16 points, Phil Cofer added 12 and P.J. Savoy finished with 11 points — all in the first half. “Our leading scorers (Terance Mann and Braian Angola) were not as effective,” Hamilton said. Mann and Angola, who average 28.7 points per game together, had just eight points combined. The Seminoles finished at 40.6 percent from the field (26 of 64) and just 36.8 percent (14 of 38) after halftime. Both teams struggled shooting early — Florida State went 5 minutes between field goals and Notre Dame nearly 5 minutes — before the Irish found their stroke from 3-point range hitting six of their first 12 en route their biggest lead of the half, 32-22, with 3:42 before the break. The Irish then answered a 6-0 Seminole run and took a 40-34 halftime lead on Farrell’s fourth 3-pointer, who had 14 points. The Seminoles caught the Irish 52-52 with 10:29 left on Walker’s 3-pointer. But Gibbs made three free throws after being fouled by Angola attempting a 3-pointer to give the Irish a 61-56 lead with 7:49 left. 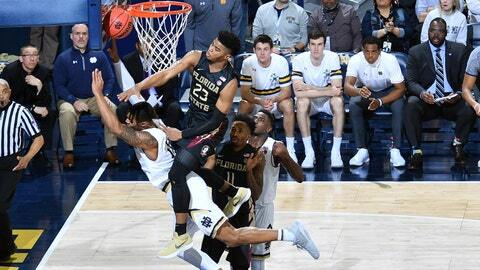 His driving bucket, combined with FSU‘s 3-minute scoring drought, gave the Irish a 70-58 lead with 3:57 remaining and Notre Dame pulled away. Florida State: The Seminoles had won four of its last six games in the ACC prior to Saturday’s loss. FSU has five games remaining, three at home starting with Tuesday’s game against No. 16 Clemson, which FSU also plays Feb. 28 on the road. The combined records of their five remaining opponents is 28-30. The Seminoles likely will need a good ACC Tournament run to get an NCAA bid. Notre Dame: The Irish got another strong start from Farrell, who had missed five games with a sprained ankle and was starting for the third straight game. He had 19 points in Tuesday’s 96-85 victory over Boston College that broke a seven-game ACC losing streak after scoring 16 in a 76-58 loss at North Carolina State. Notre Dame’s victory was not the way Florida State Athletic Director Stan Wilcox wanted his day to end. Wilcox played on Notre Dame’s 1978 Final Four team coached by Digger Phelps. That team was honored at halftime. Notre Dame hasn’t been to the Final Four since, though Brey has two Elite Eight teams to his credit. This year’s squad was thought to have an outside shot but the injuries after Christmas ended that. Among the players returning from that 23-8 team that lost to eventual runner-up Duke and Arkansas in a consolation game were Tracy Jackson, Gilbert Salinas, Jeff Carpenter, Don “Duck” Williams and Kelly Tripucka. Florida State: Hosts No. 16 Clemson Wednesday. Notre Dame: Visits No. 21 North Carolina Monday.